I’ve covered making vegetable stock and using a pressure cooker for stocks made from cooked bones, but what about fresh bones? 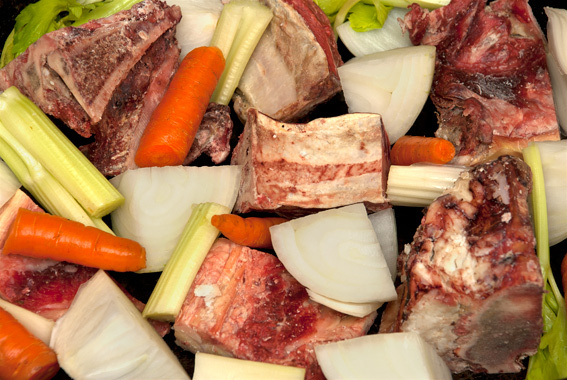 When making a beef stock, especially for something like onion soup, fresh beef bones are the order of the day (the same applies for any fresh meat bone stock). This is where going to a local butcher is really important, since you are unlikely to get bones from a supermarket. 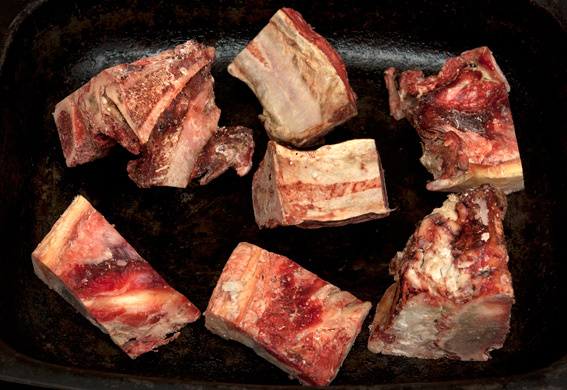 If you buy meat from a good butcher, on a regular basis, he will give you some bones, or at worst charge you 50p. 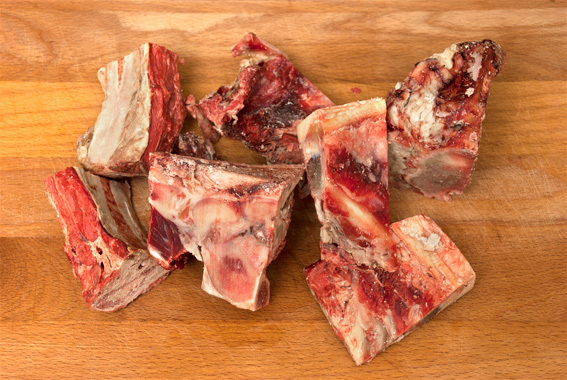 What you want are bones with bits of fat and meat still attached – this is what provides the flavour. To add flavour to your bones, before cooking them in water, put them into an oven tray with an onion, 2 carrots and 2 sticks of celery (all cut up into a few pieces, not finely chopped) with a splash of olive oil. Roast the bones and vegetables in the oven for about an hour at 200º C, turning after half an hour. You just want to brown the bones and vegetables to caramelise them and bring out the flavour, don’t burn them to a crisp. 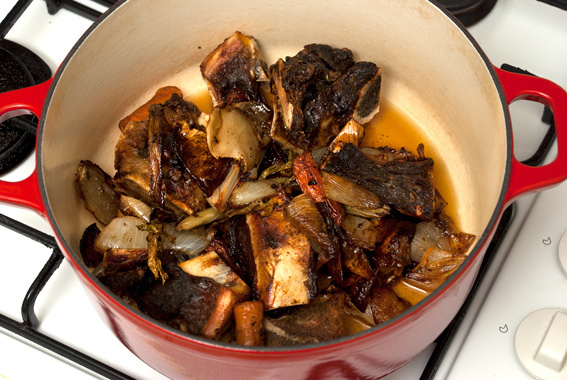 Once roasted, transfer the contents of the oven dish to a large cast iron casserole. Deglaze the oven dish with a little red wine and pour that into the casserole too (it’s all good flavour). I had some fat and rind from a Spanish Jamón Serrano, which I put into the pot for extra flavour. 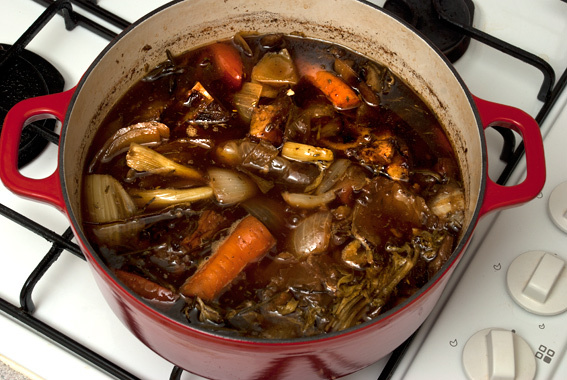 Simmer the stock for 3 hours or more on a low flame. If you want a clear stock you should never let it boil, or it will go cloudy. Skim off any scum from the surface of the stock as it cooks. 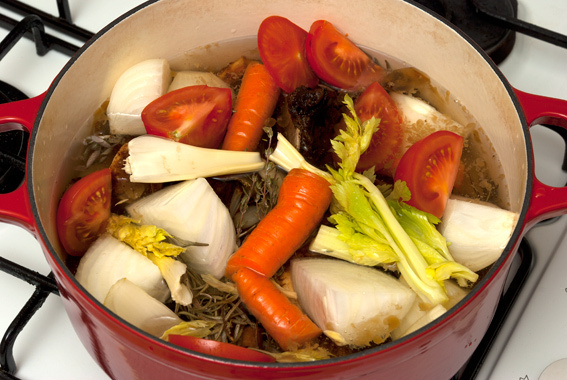 When cooked, put the stock through a sieve to remove all the bones, vegetables and herbs. 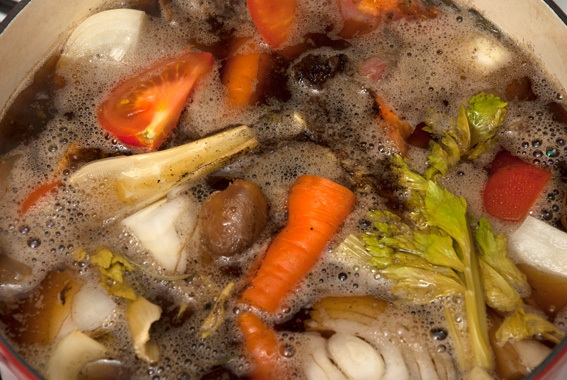 For a clear broth it’s necessary to filter the stock through some muslin once or twice. When all solid particles have been removed and the stock is clear, it can be boiled to reduce it if necessary. 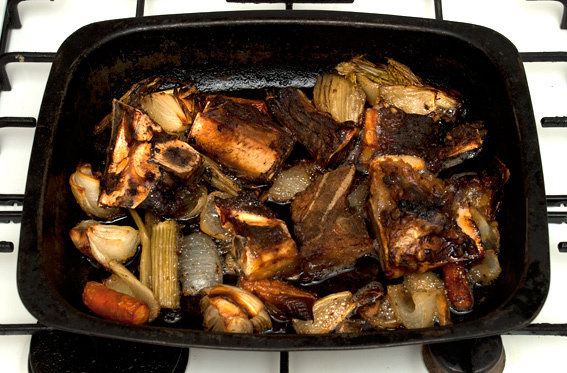 According to Hugh Fearnly-Whittingstall, in The River Cottage Meat Book, one should never mix the bones of different animals when making stock, it’s like “Mixing tea and coffee.” His suggested exception to this rule, is the inclusion of pork or veal bones to any meat stocks, for additional flavour. This entry was posted in Food, Meat, Recipes, Shopping and tagged beef, bones, butcher, garlic, herbs, Hugh Fearnley-Whittingstall, mirepoix, stock, tomatoes, vegetables. Bookmark the permalink.